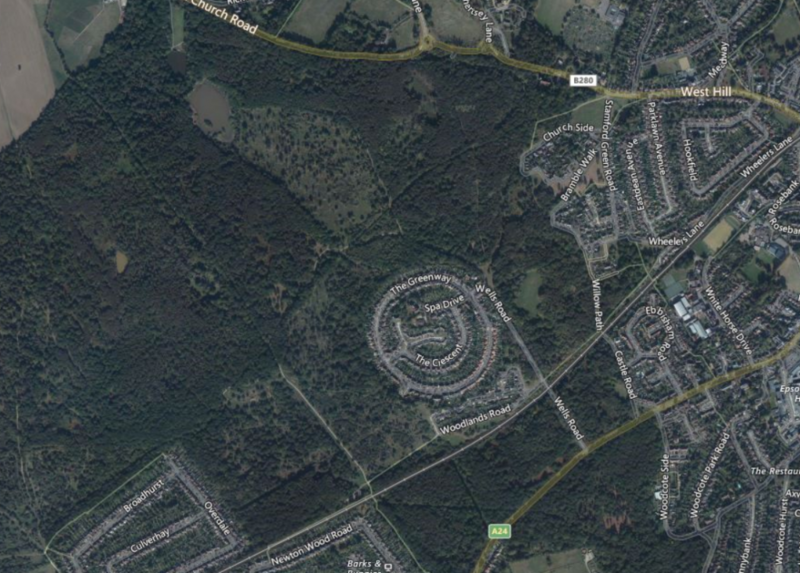 Doing some map surfing and came across the Wells estate on Epsom Common, Surrey. 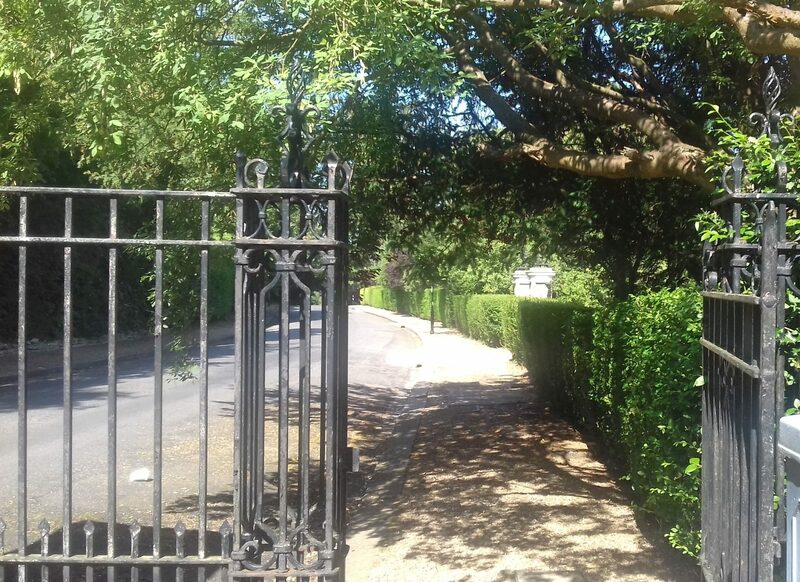 It’s a 1930s housing estate in the middle of the eastern edge of the common. 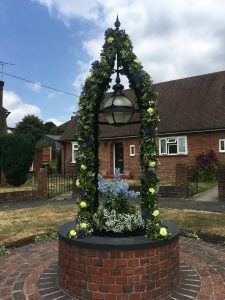 Thanks to some asking around on Twitter by Municipal Dreams, and some basic information on local history websites, the site is based around the ancient Epsom Salt well but this had long gone. There was an 18th century farm there that made the rectangular encroachment, but I’m still looking for information on the rest of it. 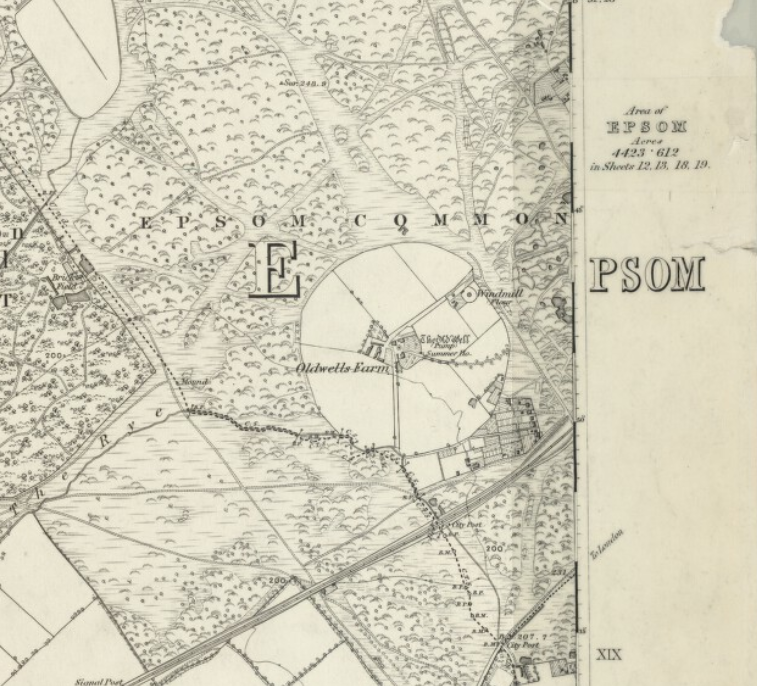 (http://www.epsomandewellhistoryexplorer.org.uk/EpsomCommonShort.html: states, “The obvious feature is the circular area whose origin is the “Epsom Wells”. By the time of the late 18th century and early 19th century these days were long gone and the area was a farm with farm buildings and a windmill. The rectangular area to the south was removed from the Common to enlarge the area of Wells Farm and as such was never an encroachment, more of an eventual occupation but it seems that the farm struggled to survive and by the 1850s was no longer a complete working farm and became a residence for a wealthy tenant. The 1851 Census return shows John Richard (Landed proprietor) in residence at the Old Wells. It was probably during this time that occupancy of the rectangular area took place, with many small individual plots (the 19th century version of allotments) combining and overtime, the first cottages started to appear about 1858.” But notably the website doesn’t then say anything about the 1930s estate. 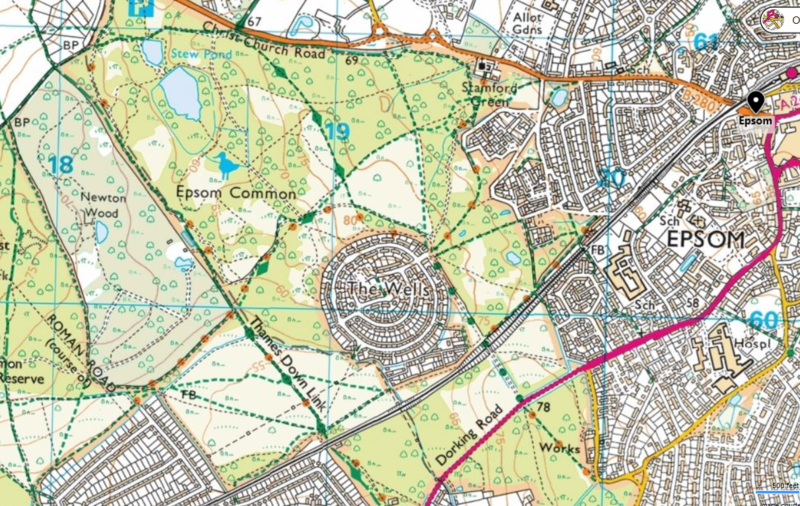 I’m hoping a trip to Surrey History Centre will provide more information on the landownership and development of the estate. As always, I’m interested in how the residents conceived of public space, especially in being in such an unusual position on the common. 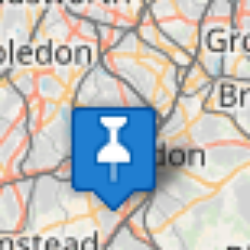 Any information or further reading welcome before I go and find out. Comment below.